This is soup weather. Period. We’ve got a ton of snow on the way, so my fam is going to be enjoying some warm, hearty soup this weekend! Our favs are potato, vegetable beef, and corn/potato chowder. Throw it in a bread bowl, and you’ve got a party. Please take a minute to share what your family enjoys! Happy Friday! These little morsels have other names, but if you love blue cheese, as I do, you will love love love these!! I know they sound weird, but hang in here with me, they are amazing. 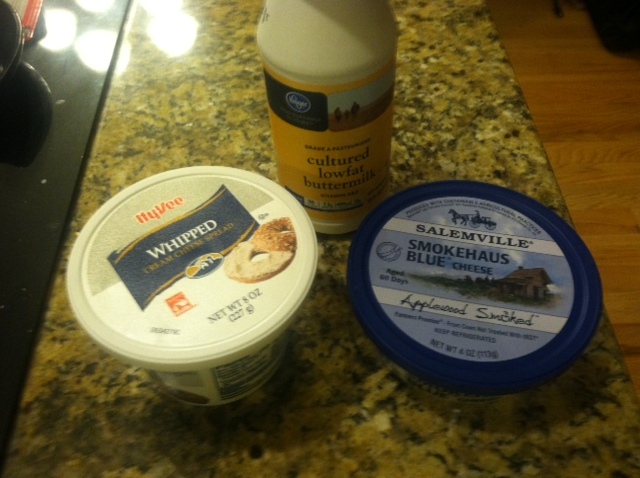 In fact, I used my very favorite blue cheese, which is Maytag Blue Cheese, (thank you Gina Coffman) produced by http://www.maytagdairyfarms.com/. However, I love gorgonzola and basically any blue cheese. I am giving credit to my love and cooking partner hubster, Mike, because this is one that we re-created together, and he charges on with making them, once I brew up the cheese mixture. We were introduced to these at a work Christmas party of his many years ago, and we think we’ve done a pretty good copycat job. (yes, the cooking operation is a joint one at the Beene Ranch). I will go ahead and admit now that if you are looking for a lot of specific measurements, you’re in the WRONG place. If you grow up in the restaurant business, with parents that are good cooks, you’ll find that things aren’t typically measured. My husband gives me a LOT of grief about not following recipes. I feel that a recipe is just an outline…kinda like you had to write in Public Speaking 101 in college. Between outline topics, you ad lib. 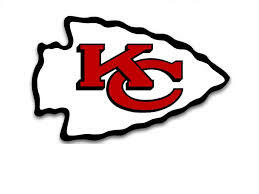 I can tell you that if you just hang in there and give it a little KANSAS CITY CHIEFS try, you’ll be able to enhance your creativity and cooking skills!!! Warning: my dishes don’t ALWAYS work out. Seriously. Some stuff I’ve made is not good (and I probably should have used a recipe or measured ingredients). If I’m at the lake, I just toss it in – figure the fish will like it. Speaking of the lake, and cooking, don’t par boil jalapenos in the cabin of a boat. It doesn’t work out. At. All. Those ended up in the lake too, and not at my friends Dee & Betty’s party – I couldn’t stand the fumes. So, let’s focus. Mix the whipped cream cheese with blue cheese to taste, slit the dates open, stuff them with blue cheese mixture, and wrap with 1/3 piece of bacon. Secure with toothpicks that have been soaking in water this entire time. Now I will tell you that some people make these and pre-cook the bacon a little bit. I think that’s a great idea, and haven’t tried it, but I plan to. Will make it much quicker since the bacon will crisp up more pronto. Place on a baking rack and dream about deliciousness. 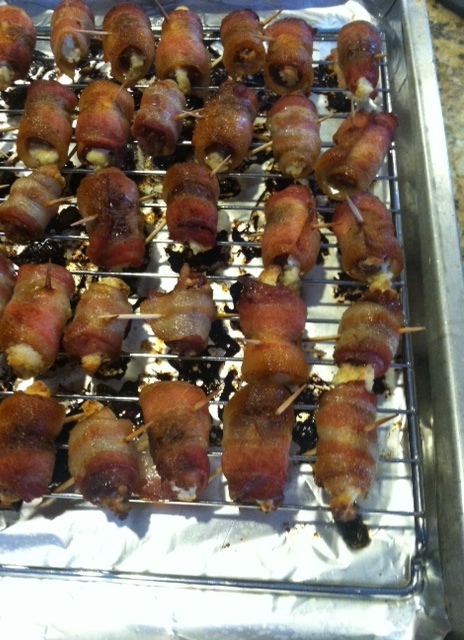 These need about 30 minutes or so, but if you try the pre-cooking bacon suggestion, should be less. Anyhoo, this is what they look like, and eat some before your guests arrive, or you may not get any. The only other thing you might do is to let someone try them who despises blue cheese — oh crap, that’s funny. 🙂 Try to have your phone camera ready. Mix cheese together to taste. Slice the date along the side and stuff with blue cheese mixture. Make sure that the slit is completely covered and bacon overlaps. Wrap with bacon, securing with toothpick and place on baking rack. Bake for approximately 20-30 min or until the bacon is crisp. Good warm or cold. 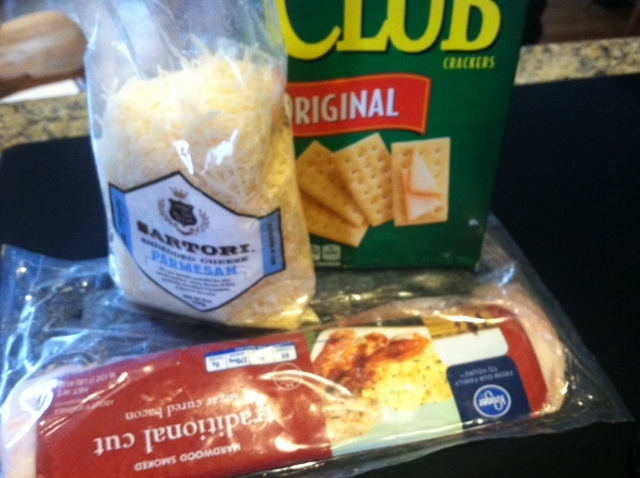 You will need a box of club crackers, a package of bacon (cut the slices in thirds) and shredded parmesan cheese (the fresher the better). 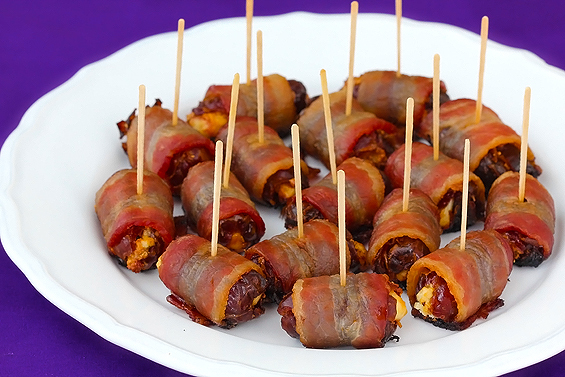 Place a little pile of the cheese on each cracker, wrap the bacon around it, lay the little morsel of deliciousness on a baking rack, and about two hours later, heaven will be ready for your consumption! Like all my recipes that I love to make, super fast, super easy and your guests will chomp them up (if you leave any for them). Enjoy these, and let me know if you try them with brown sugar – bet they’re good also! Line a broiler or jelly roll pan with foil. Place wire baking rack on top of it and I recommend spraying baking rack with non-stick spray. 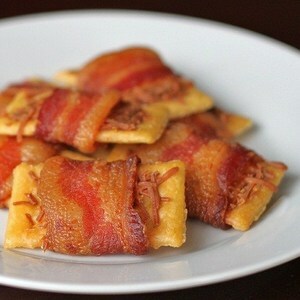 Place small pile of cheese on each cracker and wrap bacon around the cracker, placing on rack, seam side down. Bake at 250 degrees for a little over an hour (maybe 1 hr, 30 or so). 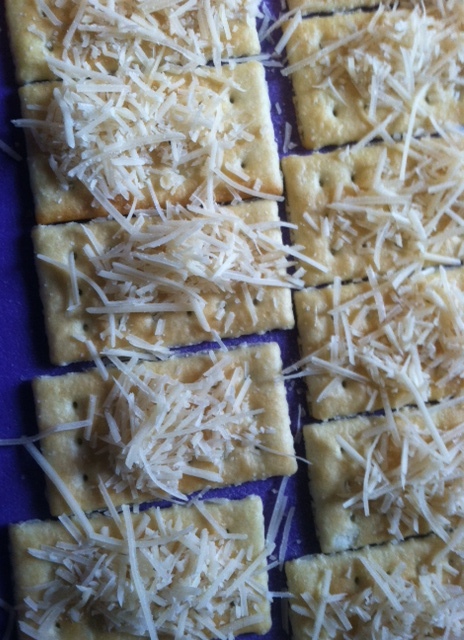 Check on crackers at 1 hour to make sure cheese isn’t burning or overdone. If the cheese is getting too overdone, cover with foil and continue cooking until bacon is at desired crispness. Hello! I thought I’d start this blog with some appetizer recipes since pretty much EVERYONE loves appetizers and this one is easy to make! With a house that’s way too big unless all the kids are home, my husband and I enjoy entertaining, and have the perfect basement in which to watch a lot of football (and play pool, ping pong, and foosball). Our friends frequently join us for NFL and K-State sports, and that being said, we recently hosted a Super Bowl party. I want to share some of the easy, unique appetizers that were consumed quickly. I found this recipe on the Pedro Lopez Brand Facebook page and it calls for chili powder and crushed red pepper to give the crackers a kick! It was also very easy to make so the next time you need a crowd-friendly appetizer in a rush, you can whip these up in a jiffy! Gather all your ingredients together before you get started (I hate it when I get started with something and then realize I’m missing a key ingredient). Once you’ve got it all sorted, combine the oil and seasonings together. 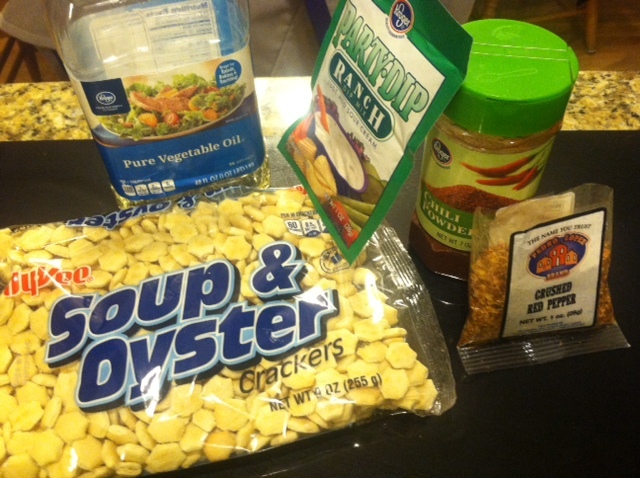 Pour the mixture on the oyster crackers and stir to coat. Then spread on a cookie sheet and let dry (approximately 30 minutes). Store in an air tight container (if there’s any left after your friends leave). Voila! Super fast, super easy and super yummy. I hope you enjoy these as much as we did. Would love to hear your impressions or feedback below! Combine oil and seasonings. 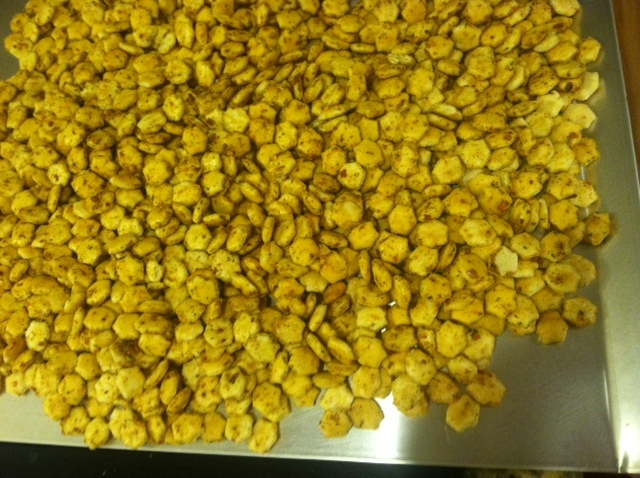 Pour over oyster crackers and stir to coat. Spread on cookie sheet to dry. Keep stored in air tight container. Note: You can use regular chili powder and crushed red pepper but if you choose to use Pedro Lopez it’s available at Dillon’s and Kroger stores.